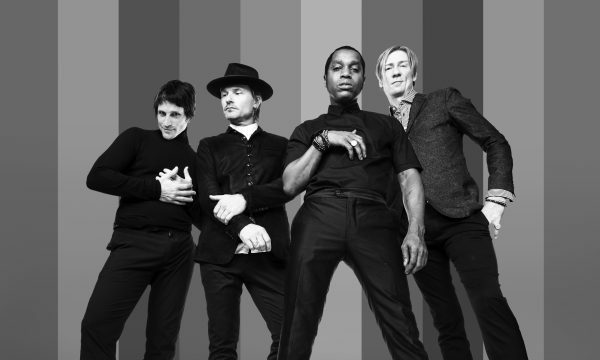 Since forming in 2010, VINTAGE TROUBLE has quietly become rock ‘n’ roll’s best kept secret, anointed by its very gods on international tours in every corner of the globe. Distilling swaggering rock, soulful blues, R&B (rhythm & blues) grooves, and pop ambition into a bold and brash brew, the quartet—Ty Taylor [vocals], Nalle Colt [guitar], Rick Barrio Dill [bass], and Richard Danielson [drums]—have logged 3,000 shows across 30 countries on tour with divinities such as The Who, The Rolling Stones, AC/DC, Lenny Kravitz, and Bon Jovi, to name a few. Along the way, they also performed on Later… with Jools Holland, Jimmy Kimmel LIVE!, Conan, The View, and The Tonight Show (four times in one year!) in addition to receiving acclaim from New York Times, NPR, The Wall Street Journal, Billboard, Rolling Stone, and more. With a trio of albums under their collective belt, namely THE BOMB SHELTER SESSIONS, THE SWING HOUSE ACOUSTIC SESSIONS, and 1 HOPEFUL RD., they challenged themselves like never before on the 2018 EP, Chapter II. Inspired by this sterling reputation on the road, VINTAGE TROUBLE aimed to seamlessly translate that stage spirit into the studio setting for the first time. In order to bring that vision to life, the guys traded Southern California for the Cayman Islands. Throughout two ten-day trips to a private studio, they recorded a bevy of songs and culled them down to what would become CHAPTER II alongside producer Jeeve [Bruno Mars, Carlos Santana]. Instead of recording live a la previous releases, the musicians tracked individually for the first time and incorporated keys and horns into an expanding soundscape. CHAPTER II represents the beginning of what might be VINTAGE TROUBLE’S greatest chapter yet.